Brandenburg used to be called the sandbox of the Holy Roman Empire for its poor soil and marginal geography. Today a more appropriate moniker might be “the wind farm of the European Union” for all the spinning turbines that tower over the flat landscape. In Bavaria’s Holledau region endless rows of hop bines still undulate through the hills as they have for centuries; but today they share the south-facing slopes with solar panels. Germany’s Energiewende (“energy transition” or “revolution”) has transformed its countryside. The main tool in this transition is a policy of subsidising renewable power. Germany guarantees investors in green energy that their electricity is fed into the grid before that from conventional sources, and at high prices fixed for 20 years. Thanks to this support, the share of renewable energy in German electricity generation has gone from 3.6% in 1990 to 30% last year. But although green energy is subsidised in most of the EU and America, Germany’s efforts are unusually generous. Consumers pay the price of the subsidies—more than €20 billion ($22 billion) each year—through their electricity bills. Germans pay more for power than all other Europeans except Danes (German industry is exempt from some of the burden). This reform is an important step toward a market economy, says Patrick Graichen of Agora Energiewende, a think-tank. But problems remain. Local politicians, especially in Bavaria, take a NIMBYish attitude to the power lines that need to be built to bring electricity from the windy north to the industrial south. Those lines must now go underground, making them more expensive. Moreover, the new reform does not address the more fundamental flaws in the Energiewende. The first is that even as the share of renewable energy in electricity generation rises, overall production is so far not getting cleaner, as measured by emissions. One reason is the snap decision after the disaster at Fukushima in 2011 by Angela Merkel, the chancellor, to phase out nuclear power (which emits no greenhouse gases) by 2022. While renewables can easily compensate for this missing nuclear capacity on windy and sunny days, other energy sources are needed for the rest. Environmentally, gas-fired power plants would be the next best option, but they are more expensive to run than coal-fired plants. And so Germany continues to rely on dirty lignite and only slightly less dirty hard coal. This gives the Energiewende a “credibility problem”, says Claudia Kemfert at the German Institute for Economic Research. Alongside this, the Energiewende has so far focused almost entirely on electricity generation. But electricity accounts for only about 21% of energy consumed in Germany, with the rest used to drive cars and trucks and to heat homes. Renewable sources play a negligible role in these sectors. Electric vehicles remain more of a marketing dream than reality. Too few Germans drive them to make the air cleaner, though this may change in the wake of the Volkswagen diesel emissions scandal last year. The policy of the Energiewende, says Clemens Fuest of the Ifo Institute, a think-tank in Munich, had three goals: to keep energy supply reliable; to make it affordable; and to clean it up to save the environment, with a target of cutting emissions by 95% between 1990 and 2050. “All three goals will be missed,” he thinks, making Germany’s energy transition “an international example for bad policy”. That may be a bit harsh. Germany’s policy has helped bring down the cost of solar panels and wind technology. But in order to get the revolution Germany really wants, far more drastic reforms will be needed. 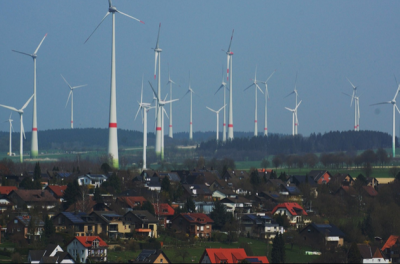 Is it true that one can see industrial wind turbines “everywhere you go in Germany”? A tourist told me that. What will it look like by 2050? I wonder how many journalists writing about these things believe that countries can singlehandedly change their own climates.